The Earl Scruggs Center is excited to announce its next special exhibit, Grand Ole Opry, a traveling exhibit by ExhibitsUSA, a program of the Mid-America Arts Alliance. 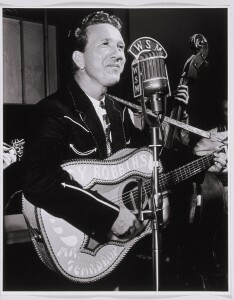 In 1925, the Grand Ole Opry, an American institution and the longest radio show in the country, began broadcasting on WSM, radio station of the National Life and Accident Insurance Company. The idea was to broadcast a show of old-time music performed by amateur musicians as a way of promoting the insurance company in and around Nashville. The show, still broadcast today on WSM, grew to become the radio home of some of the most prominent and influential artists in the country music genre, including Minnie Pearl, Chet Atkins, and Ernest Tubb, and it was an important and enduring chapter of radio history. It brought country music to the masses and created superstars out of a little-known genre of singers. Gordon Gillingham, June Carter and Little Jimmy Dickens nudge Hank Williams Jr. toward the microphone, January 16, 1954, gelatin silver print, 16 x 20, private collection. © Gordon Gillingham. Photo: E.G. Schempf. 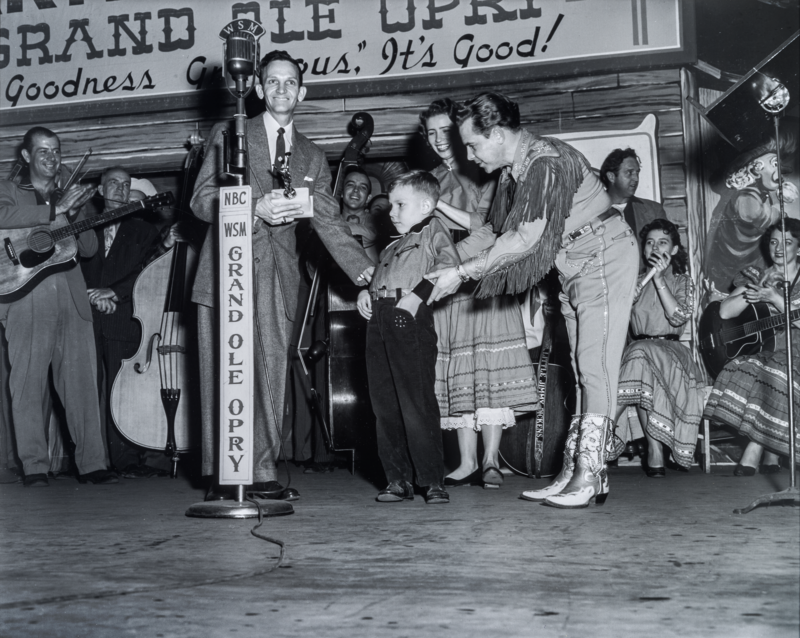 ExhibitsUSA’s Grand Ole Opry features gelatin silver prints by Gordon Gillingham, a commercial photographer hired to photograph the Opry between 1952 and 1960. 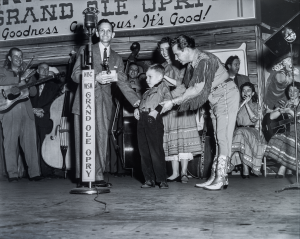 The images document the radio show and the country music business during the zenith of country music’s postwar boom, and wonderfully capture the spirit, energy, camaraderie, and sheer joy of performing that permeated both musicians and fans of The Opry in its heyday. Gillingham’s photographs show us everything from Johnny Cash signing autographs backstage to artists rehearsing for the Grand Ole Opry television show to crowds of fans gathering outside The Ryman auditorium. Today, The Opry is an American icon that continues to honor and showcase country’s longstanding legends like Patsy Cline, Johnny Cash, and Dolly Parton, as well as contemporary crooners like Carrie Underwood, Dierks Bentley, and Blake Shelton. The Opry stage presents multiple concerts each week and draws thousands of music-lovers each year. We are proud to have the City of Shelby as our Presenting Sponsor for this exhibit. And our In Kind Sponsors Westmoreland Printers Incorporated and Shelby Signs. Posted on Friday, July 15, 2016 .